Metabolism is a term that describes all of the chemical reactions that take place in your body, the processes that are needed to keep your body alive and kicking. This term is also used interchangeably with the term 'metabolic rate', which is the number of calories that you burn to stay alive. 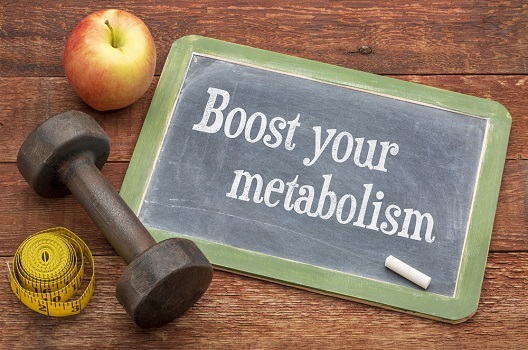 Generally speaking, the higher your metabolism happens to be, the easier it is to burn calories and lose weight. It's not all about losing weight, however, with a faster metabolism also linked to hormonal balance and improved mental health among other benefits. While the links between fast metabolism and weight loss are not as clear as some people would like to think, there's still a lot we can do to burn calories and improve our general physical health. Eating certain foods and doing specific exercises can increase your metabolism for a few hours, with long-term changes much harder to come by. In order to have any significant effect on your resting metabolic rate, sustainable changes are needed in all areas of your life. It's also important to understand that some people just have a slower metabolic rate than others, and scientists don't even really know why. Exercise is probably the biggest tool we have at our disposal, with working out known to build muscle mass and muscle known to speed up metabolism. While cardio training is still important, free weights and bodyweight training can help you to lose weight along with gaining muscle. If you do manage to gain more muscle and speed up your metabolism, it's important to fight the natural urge to eat more food. Even with exercise, people often revert to their natural metabolic rate, with very little we can do to change our resting metabolism. Vitamins and minerals can help our metabolism to function effectively, however, with certain supplements and whole foods capable of maintaining and boosting critical body functions. B vitamins are especially important in this role, including B12, biotin, folate, and B6 among others. Lean meats and seafood are the best way to get a healthy supply of Bs, which are also available in eggs, dairy products, and whole grains. Vitamin D is also important for your metabolic function, as is calcium, iron, and magnesium. Lifestyle factors can also have a positive effect on your metabolism, with sleeping, eating, and exercise patterns likely to have a significant effect. In general, how we do things has an even bigger effect than what we do. Drinking more water can have a positive effect on our metabolism, as can regular small meals, high intensity workouts, healthy sleeping patterns, green tea, chillies, and working out in the morning. Even though it's really hard to change your resting metabolism, making these changes will make you healthier and happier and that's an even better result.